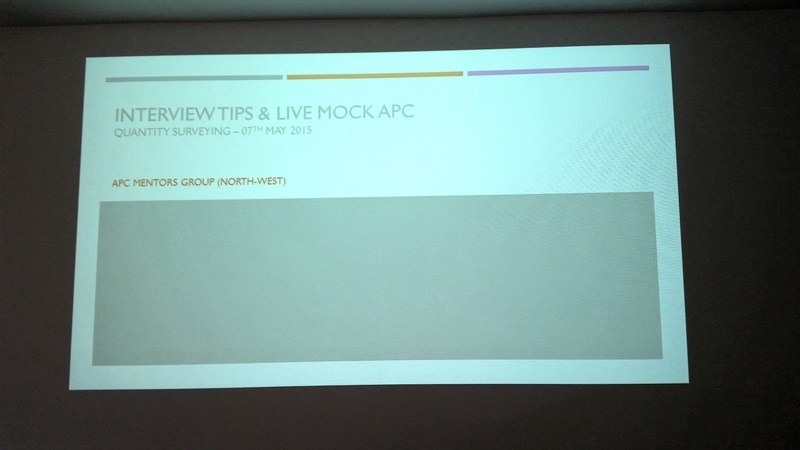 If you missed our ‘Interview tips and Mock APC’ workshop in Manchester on 7th May 2015, here are some of the topics that we discussed. The assessors’ expectations are listed in the RICS Candidate’s Guide but how do they translate in practice?! You should treat your APC panel as your most important client that you are pitching for a very important contract. No matter what happens in the interview room, you should always behave with the utmost professional attitude. You would not argue back or crumble in front of a client and your APC is no different. Watch your body language and do let negative feelings get the best out of you. Dress smartly and show confidence, but be mindful that there is a fine line between confidence and arrogance that you should be vigilant not to cross! The quality of your documentation – Your perceived strengths and weaknesses. The pertinence of your key issue(s) and the reasoning applied to achieve the solution. Your presentation skills – Documentation, case study and interview. The quality of your answers during the interview. This means that you do not have to be perfect in every aspect of your assessment. You can still become chartered if you stumble a little in one competency but are brilliant in the others. You can download the Assessors Mark Sheet from the RICS website or at the bottom of this post. Presentation: Presentation and communication skills, body language, reasoning. This is a topic in itself but do not neglect your 10 minute presentation. It is your chance to shine on a topic that you know well and show the panel what you are made of. Technical questions: Concise and precise answers, awareness of industry, all levels covered. Even if you know a topic in details, do not waffle or ramble on it. Give a short and precise answer. The assessors only have one hour to assess you on a large number of competencies. Achieving this takes practice, so organise Q&A sessions with colleagues or fellow candidates. Do not try to waste time hoping that you will be asked less questions. If the assessors cannot test you in all the competencies, they cannot pass you! Listen to the question and answer it. Do not answer you own questions! If you are unsure, ask for the question to be rephrased or clarified. If you do not know an answer, say that you do not know. Do not take a wild guess. Ask to come back to it at the end of the interview. (Do not use this card too often though!) The chairman of the panel will ask you at the end whether you would like to come back to any question or add anything. If you have a bright spark, come back to it – Otherwise, say nothing! You do not want to leave the panel on a confused or incorrect answer. Demonstrate your understanding of the role and responsibilities of a chartered surveyor. Read the RICS website. Show an awareness of the RICS activities and objectives. Know your rules of conduct and professional and ethical standards inside out! Ability and confidence to work unsupervised. Ultimately the panel wants to assess whether you are a safe pair of hands to represent the best interests of your clients, your employer and the RICS. Ability to apply your professional and technical skills to benefit your clients. Remember that you need to demonstrate level 3 in your core competencies. Give examples of your work whenever suitable and do not omit to explain how you advised your client. You are also expected to be able to justify why you made specific decisions in your projects. Why do candidates get referred? The submissions are not presented in the required format, greatly exceed the word count or contain significant technical or professional errors. This is not a cause for referral in itself but it will certainly not go in your favour if you are borderline. The presentation does not reflect the candidate’s written submissions. It is apparent that your supervisor wrote it for you and that you do not have as much experience as claimed in your record of experience. The candidate’s communication, documentation or attitude is not professional. The candidate is unable to demonstrate knowledge or experience relating to the declared competencies. This could be deficiency in just one competency or a range of competencies. ⇒ They did not revise level 1 / basic textbook best practice. ⇒ They are weak in ethics and rules of conduct, do not understand what the RICS is about. ⇒ They lack of experience / client exposure or cannot relate it to the competencies. ⇒ They have done things their way for many years and do not care much about best practice and standards. ⇒ They work in a highly specialised area (which is not a cause of referral in itself) and have not broaden their horizons through private study. The panel is not convinced that they could transfer their skills and experience to another client. Remember that the assessors want you to pass! They have been trained to show interest in your presentation and answers, and to question you on your own personal experience. Approach your APC as a chat between professionals and you will be fine! Each session, we offer mock APC interviews for candidates in the construction pathways (QS / PM / BS / Infrastructure) in the Manchester area. Please e-mail us at Sonia@APCsupport-ltd.co.uk for more details. We also have a number of workshops and seminars planned in Manchester, Leeds, Liverpool and Sheffield throughout the year. If you have any queries feel free to drop us a line on Twitter @APCsupport_NW or e-mail us at Sonia@APCsupport-ltd.co.uk. This entry was posted in Interview and tagged APC, help, interview, mock, support, tips.